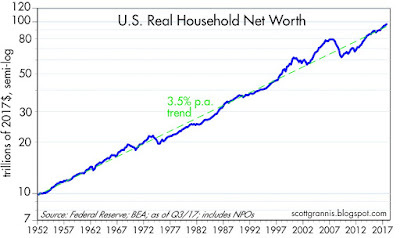 Chart #1 summarizes the evolution of household net worth. 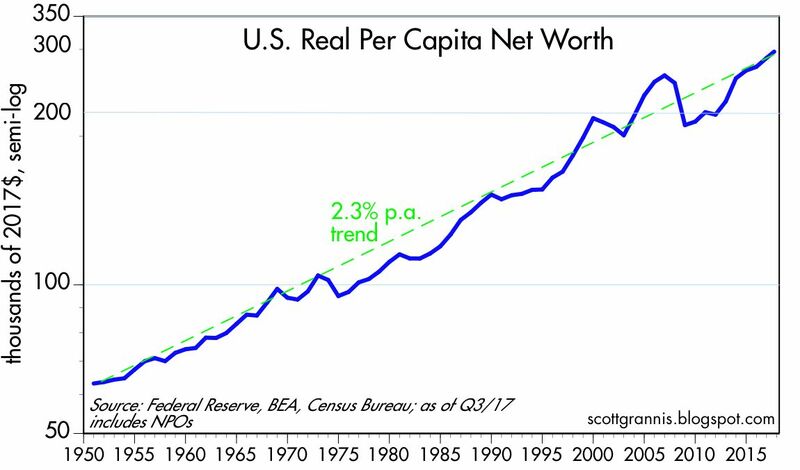 Chart #2 shows the long-term trend of real net worth, which has risen on average by about 3.5% per year over the past 65 years. Is this a great country, or what? 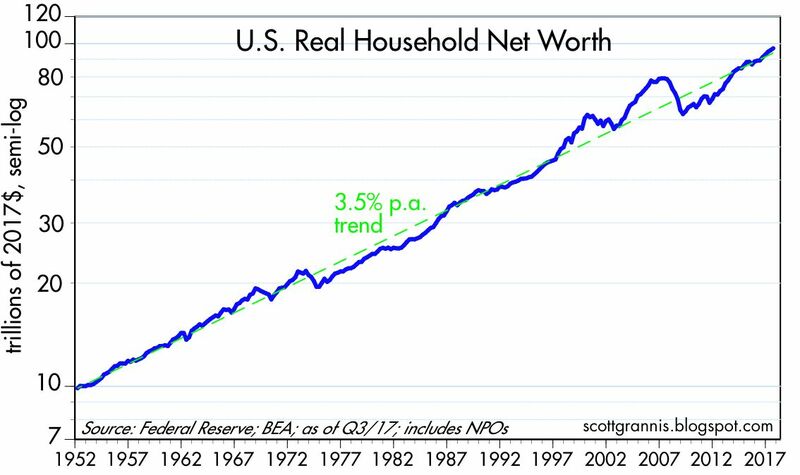 I note also that recent levels of net worth do not appear to have diverged at all from long-term trends. That wasn't the case in 2007 however, when stocks were in what we now know was a valuation "bubble." 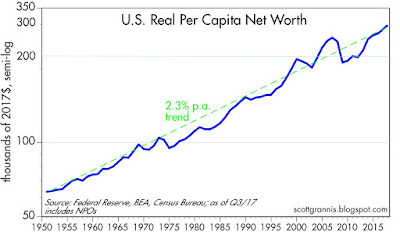 Chart #3 shows real net worth per capita. The average person in the U.S. today is worth almost $300,000, and that figure has been increasing on average by about 2.3% per year for the past 67 years. Regardless of who owns the country's wealth, everyone benefits from the infrastructure, the equipment, the computers, the offices, the homes, the factories, the research facilities, the workers, the teachers, the families, and the brains that sit in homes and offices all over the country and arrange the affairs of the nation so as to produce almost $20 trillion of income per year. 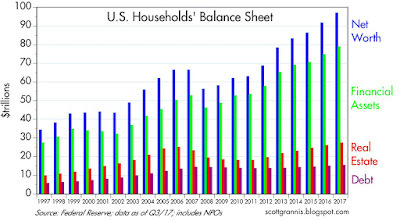 Chart #4 shows that households have been extremely prudent in managing their financial affairs since the Great Recession. 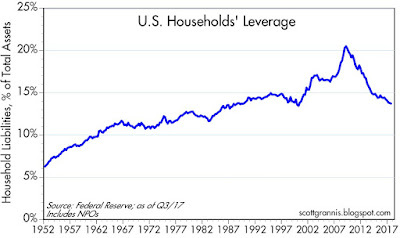 Household leverage (total debt as a % of total assets) has declined by fully one-third since its Q1/09 high. 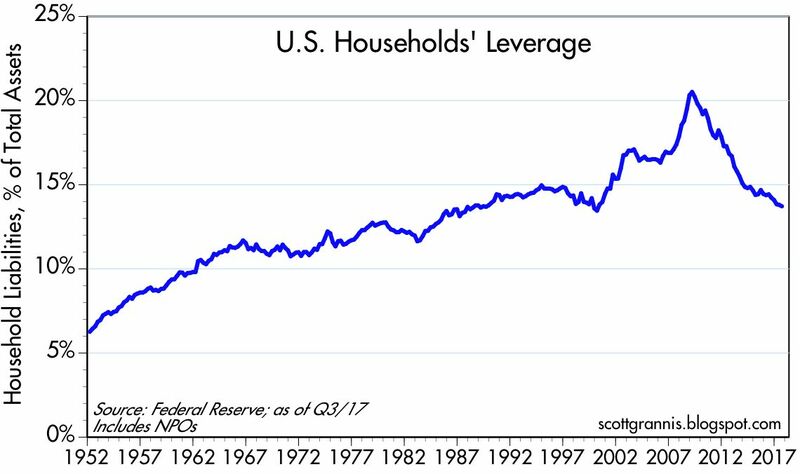 Leverage is now back to the levels which prevailed during the boom times of the mid-80s and 90s. 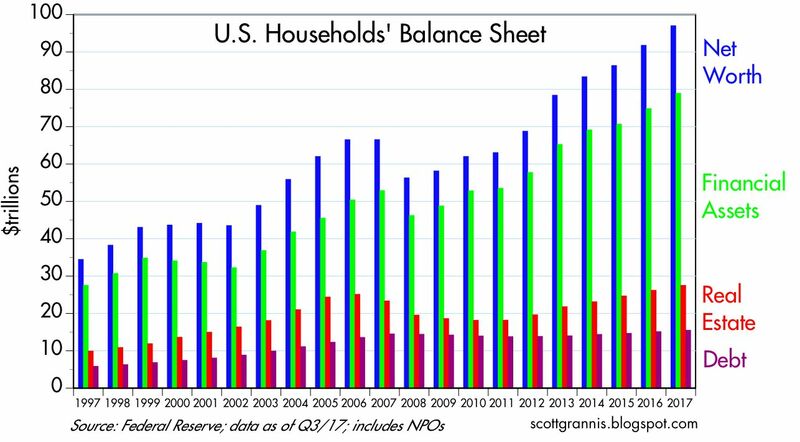 Of course, while households were busy strengthening their finances, the federal government was doing just the opposite: the burden of federal debt more than doubled from June '08 to September '17 (i.e., federal debt owed to the public rose from 35% of GDP to 75% of GDP).